During your stay perhaps enjoy the Birds of prey at our School of Falconry? Each day at 5pm we have our award-winning ‘Falconry experience’. The location for the Falconry Experience is our waterfront lawn with expert falconer Eric. The experience lasts for one hour and you will be able to hold and fly a Harris Hawk, Peregrine Falcon and Fluffy, our beautiful and enormous European Eagle-Owl on your leather glove. You can also meet Orla, our beautiful Golden Eagle. €15 per person: The cost is only €15 per person, €50 for a family of 2 adults & 2 kid, if interested just let us know and we can book you a space. The spaces always sell-out so pre-booking is essential. 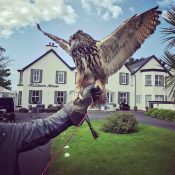 You will love this Falconry experience, Eric the master falconer and his assistant Victoria are passionate teachers and the intimate access you’ll have with the birds is unsurpassed in Ireland. There are also private falconry experiences available where you and your family/group will enjoy an extended 1.5 hour private experience, which really is a lifetime highlight experience for many people. Before or after the ‘Falconry Experience’ you can relax in our nice little ‘Robert Mitchum’ bar, where you will be able to buy yourselves some tea, fine coffee or even a Dingle Gin & Tonic. Our Mission is to enable locals and visitors to enjoy an educational and intimate experience with our majestic. We offer a daily ‘falconry experience’ for only €15 and private ‘hawk-walks’ on our waterfront lawn and the beaches of Dingle Harbour by prior appointment. We are passionate about the art of Falconry, protected by UNESCO as a living human heritage. Our beautiful birds include Eurasian Eagle-owls, Irish Barn Owls, Harris Hawks, Falcons and Orla – our majestic Golden Eagle (once extinct in Ireland since 1912). Hold & fly Barn & Eagle-Owls, Falcons, Harris Hawks & Orla the Golden Eagle.